Here at LastPass, we believe strongly in spreading the word about better password management and helping our community protect themselves against online security threats. That's why we're supporting World Password Day 2014 and encouraging everyone to use this as an opportunity to update passwords and get started with a password management system like LastPass. In January 2013, Deloitte analysts estimated that 90% of all passwords are simple enough to be hacked in seconds. Since then, Heartbleed headlines prompted Internet users to change their passwords, yet only 38% of users did. We want to help change that. Observed every May 7th, World Password Day asks people to do one simple thing, made even simpler by using a password manager like LastPass: change your password. Since 2013, more than 170 organizations including LastPass, Intel, Microsoft, and the National Cyber Security Alliance have participated in World Password Day. Last year, over 32,000 people pledged to upgrade their passwords to stronger ones. This year, World Password Day has launched a new website at passwordday.org, a video game that pits the player against real leaked passwords, and simple tips and tricks for strengthening your passwords. Take the pledge to upgrade your password, get started with a password manager if you aren't already using one, and go from hackable to uncrackable today. The most common password is "123456." The second most common is "password." 1 in 5 Internet users have had an email or social networking account compromised or taken over without permission. Data breaches exposed some 552 million identities from popular websites in 2013, a 62% increase from 2012 - and the trend doesn't seem to be slowing. The Heartbleed security flaw could have exposed sensitive data from up to 66% of active websites. Use a password generator like the one offered by LastPass to start updating your passwords to stronger, unique ones. Run the LastPass Security Challenge to identify weak, duplicate, and breached passwords. Enable multifactor (also called two-factor) authentication anywhere you can, including your password manager, your bank accounts, your email accounts. When creating a master password, choose length - make a long password phrase, like "happy2014worldpasswordday", to increase the strength of the password. If you're already using a password manager and following recommended security practices, consider sharing LastPass with others so they can make passwords easy and improve their online security. 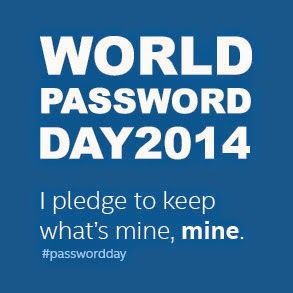 What are you doing to support World Password Day? Tell us in the comments below.